Begin your Costa Rica Surfing Travel in the stunning National Park Manuel Antonio where you can get a glimpse of its plentiful Wildlife. After a short and scenic drive to the north which offers an amazing view you arrive in Quepos and eventually the quaint town of Manuel Antonio. 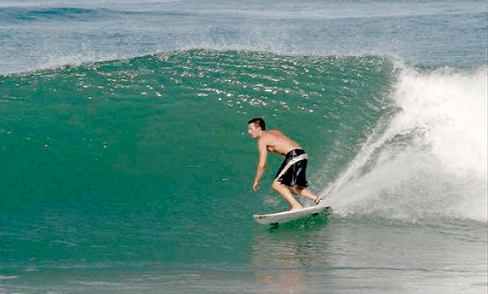 The surf school in Manuel Antonio is a perfect appetizer to get your unforgettable Surfing Travel started. While getting familiar with the warm and crystal clear waters you can experience spectacular views of the coral reef while snorkeling or you have the chance to take sail on a catamaran, feeling the soft blow of the tropical air, watching the memorable sunset and with some luck spotting a green turtle passing by towards the coral white sand. Local Biologist and Naturalist guides invite you to a hike in the unique National Park making sure you see some amazing wildlife in its natural habitat on your Costa Rica Surfing Travel. Being situated directly in the National Park, Manuel Antonio offers the opportunity to explore the lush rainforest with its overflowing possibilities: Spotting the Howler and Spider Monkeys, hearing the Toucans flapping by or walking right next to a Sloth that sleeps in a tree. Leaving the beauty of Manuel Antonio behind, you fly south towards Dominical which offers the best and most consistent waves in the country and promises yet another phase in your Costa Rica Travel Package. In this beautiful jewel Dominical you enjoy a private room at a cozy bed and breakfast that is located just footsteps from the waves. As surfing is king here, it is very easy to get a lesson and learn from the locals to improve your skills with the best instructors in Costa Rica. They promise to have you standing up on your board by day’s end to make your Surfing Travel a success. Besides riding the waves, there are countless other activities to do in this lively, cliffside paradise. As for those who love the nature there is the prospect of horseback riding into the jungle where you can take a dip in one of the hidden waterfall pools. For those who love nightlife – they say that it is second to none in Dominical and there is always a great party just around the corner! To get your Surfing Travel Package to a proper end, you board a plane to take a scenic, in-country flight back to San Jose. For reservations and more information on Costa Rica Surfing Travel Packages, please contact us.